Dwyane and Gabrielle on their red carpet. 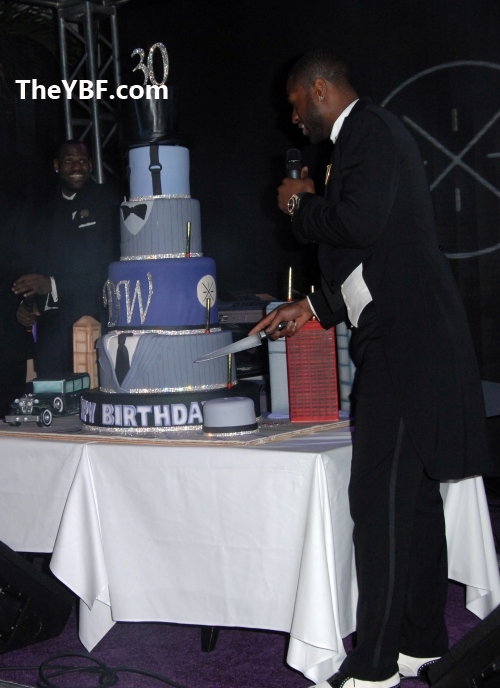 Dwyane cutting his truly dapper cake. Yesterday Dwyane Wade turned 30 years old. Two days ago, he had a huge celebration at the Setai Hotel on Miami beach. His big event was hosted by his lovely lady, Gabrielle Union, and his sister Arlesha. Since it was D.Wade's big day you already know that teammates Chris Bosh and LeBron James were in the building, but that's not it. 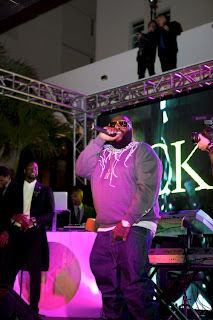 Rick Ross performing at the birthday bash. This star studded event had Kelly Rowland, T.I. and Tiny, Usher, Rick Ross and Common. Not only did they show up, but T.I., Rick Ross and Common all performed and Kelly Rowland even did a special birthday tribute for the basketball star.